Provide comfort for the family of Helen McNabb with a meaningful gesture of sympathy. In loving memory of Helen McNabb (nee Cole) who passed away Sunday, April 7th, 2019 at Health Sciences North at the age of 86. 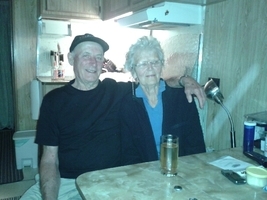 Beloved wife of Bill McNabb of Capreol. Loving mother of Carroll Dunford (Gerry) of Winnipeg, Doug of Innisfil, Glenda of Capreol and Wayne predeceased 2002. Cherished grandmother of Dale of Val Therese and Thomas of Montreal. Predeceased by her parents Frank and Minnie Cole. Dear sister of Ben and Bill Cole of Orillia and predeceased by Laurene Gower and Dorothy Norman. At this time, there will be no visitation of service. A celebration of life will be held at a later date. Cremation at the Park Lawn Crematorium. To send flowers in memory of Helen Margaret McNabb (Cole), please visit our Heartfelt Sympathies Store. Consider providing a gift of comfort for the family of Helen McNabb by sending flowers. May the family of Helen Margaret McNabb please accept my sincere condolences hoping you find comfort in God's words at Acts 24:15 and Psalm 37:29.